All-in-one water cooling solutions are highly sought after products for those looking to get into the water cooling game at an affordable price. 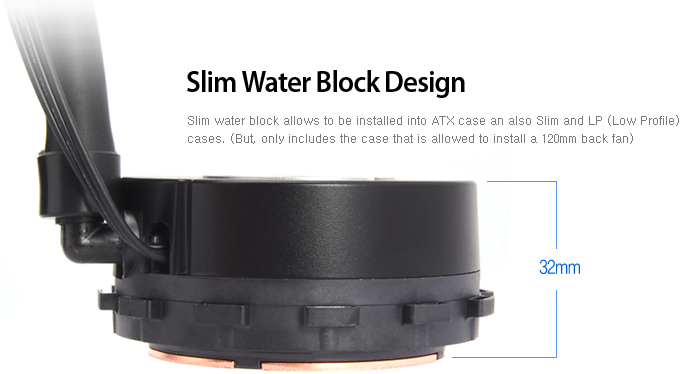 As I’m sure most of our readers know, Asetek built all-in-one water coolers span across many different manufacturers and price ranges. 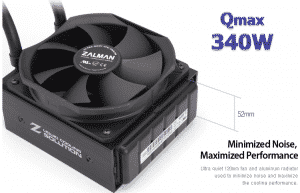 Zalman‘s latest Asetek-built offering comes in the form of the LQ320, which sports a larger radiator than its little brothers – the LQ310 and LQ315. 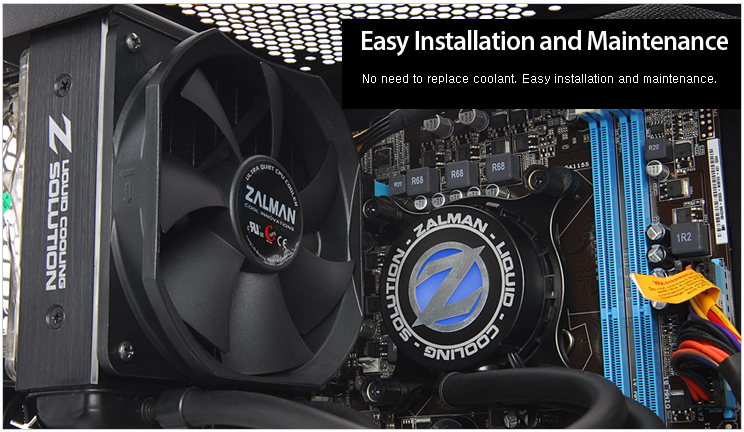 So, let’s have detailed look at this all-in-one solution from Zalman and find out if we have a viable option for your hard earned dollar! Here are the specifications as provided by the Zalman website. 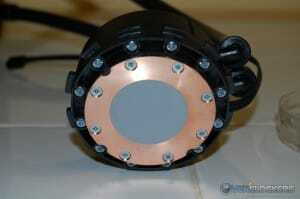 Of note here is the pure copper base and 340 Watts of potential heat dissipation. 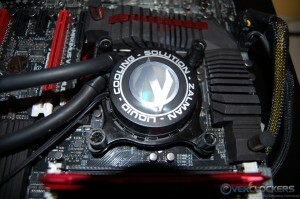 Additionally, we have full support for all current AMD and Intel platforms. Continuing on to the features, this is the area Zalman hopes to separate the LQ320 from similar options available from competitor brands. 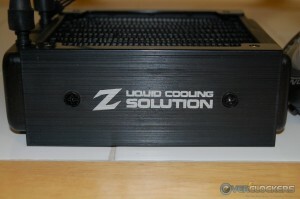 Zalman has applied a slogan of “Ultimate Liquid CPU Cooler” to the LQ series water cooling units, a lofty claim no doubt. 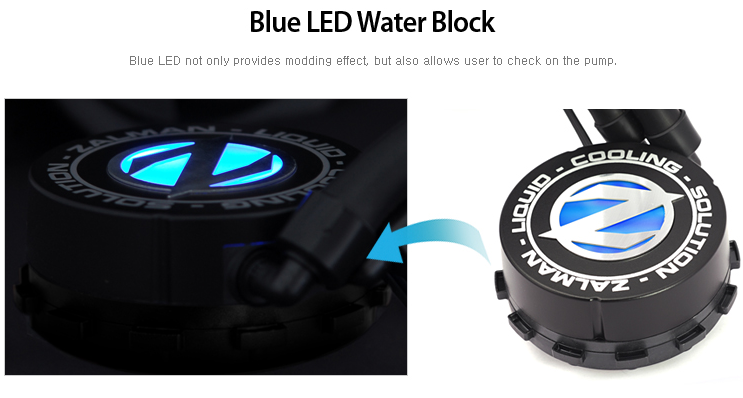 Beginning with features associated with the block and pump assembly, we find Zalman has designed a blue LED in the center. A thin 32 mm tall design was also implemented into the block/pump assembly for better compatibility and increased airflow through the case. Inside the all copper water block, you’ll notice the inclusion of Micro Fins to increase heat transfer. 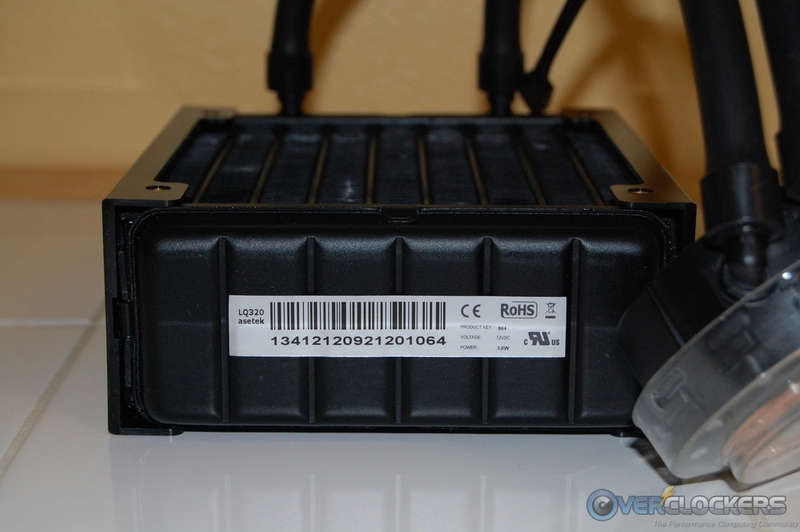 As mentioned above, the LQ320 fits all current Intel and AMD socket types. 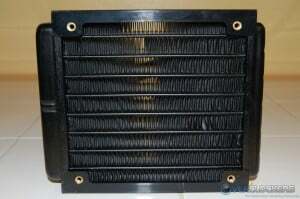 On the radiator and fan side of things, Zalman spruced up the looks by designing a plastic cover for the radiator. The cover is made to emulate the look of brushed aluminum, and it does a pretty good job of that. High quality and durable hose is said to be used and securely attached to the radiator fittings for a leak proof experience. The Qmax 340 Watt feature is merely Zalman’s way of saying the LQ320 is capable of dissipating that amount of generated heat. Maximum performance with low noise is something else Zalman wants to make you’re aware of, that’s been their forte since the beginning after all! 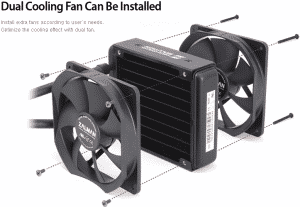 Dual fans in a push/pull setup are possible, but only one fan is included in the kit. 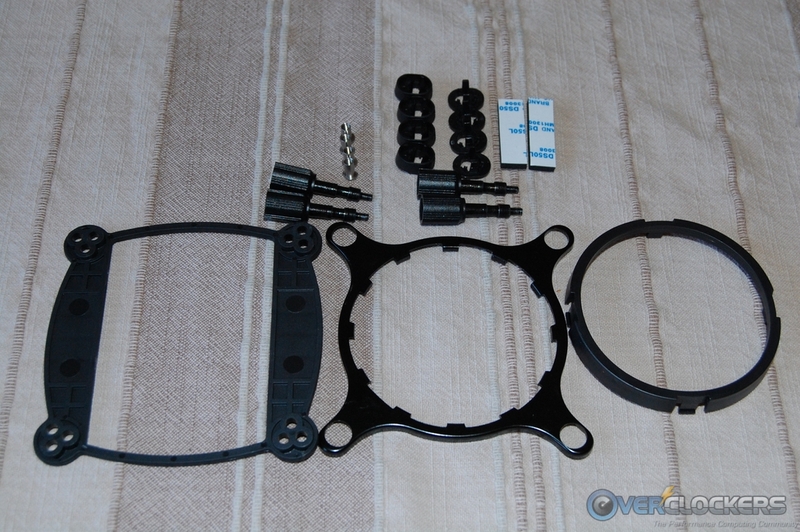 The LQ320 also features a very thick 52 mm radiator, which should give a substantial performance boost over the standard 28 mm and 38 mm designs out there. What attracts many people to any all-in-one liquid cooler is the ease of installation and maintenance. Other than the occasional exterior cleaning, there really isn’t any maintenance required. 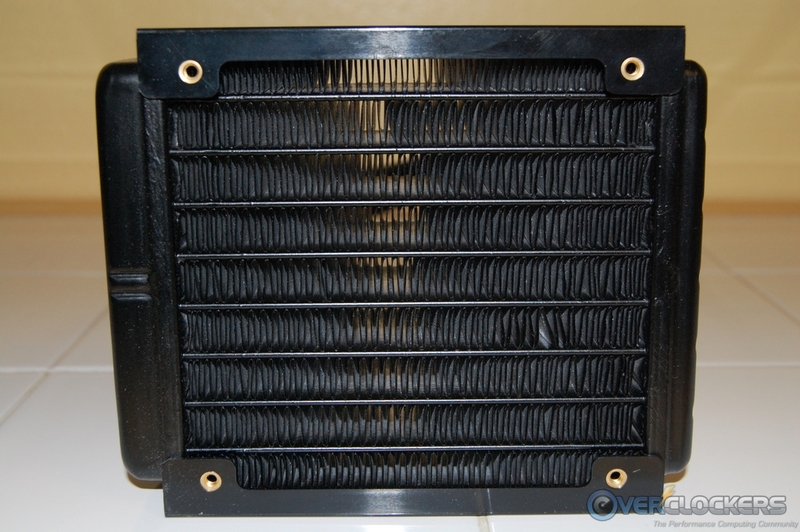 Because of the mixed metal design (copper and aluminum), it’s extremely important to use a coolant with anti-corrosion properties. 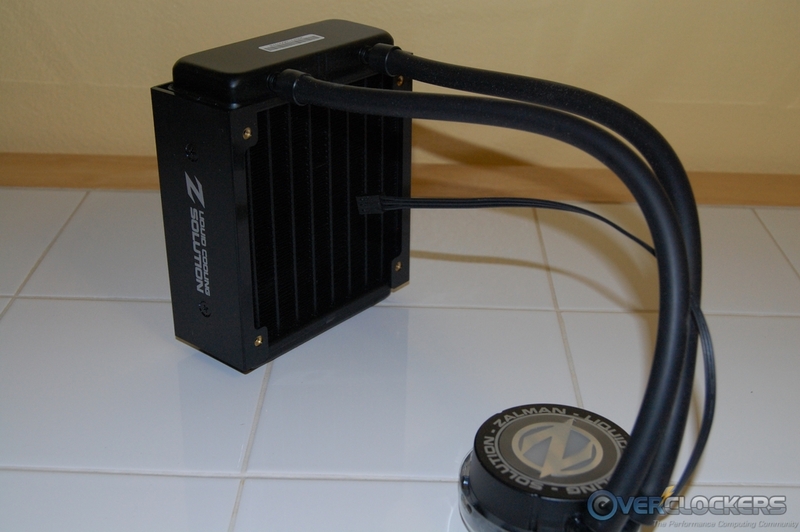 Thankfully, Zalman has done just that by using a glycol based coolant with corrosion inhibitor added to the mixture. The box has the exact same design on both the front and back, and there you’ll find some pictures to illustrate the looks and high level features. On the box sides, you’ll find dimensions, a pictorial overview, the specifications, and a multilingual list of a few features. The box top has additional Zalman branding and icons for awards they have received. As we dive inside the box, we can see Zalman has used a pocketed cardboard insert to house the contents of the kit. The top of the cardboard insert has a thin foam sheet sitting on top to protect the items below. For accessories, the kit is packed with everything you need for Intel and AMD installations. 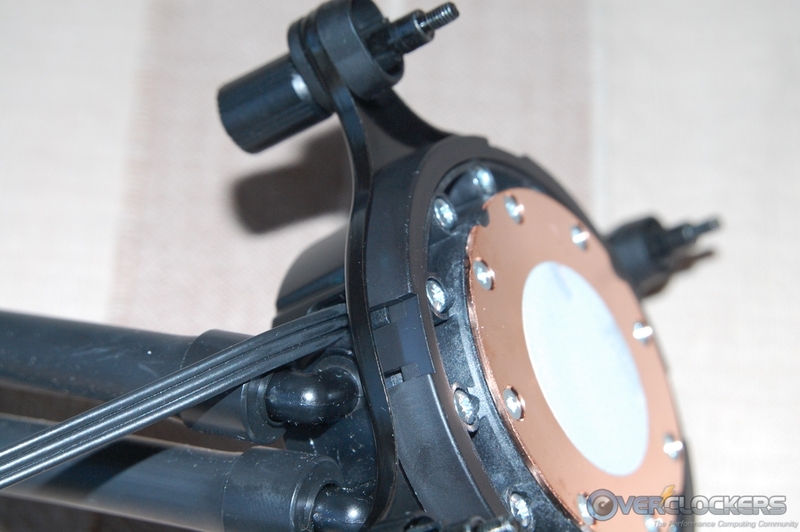 Also included is a user’s manual and the 120 mm fan. The fan is PWM capable and is marked with a part number of ZP1225ALM. 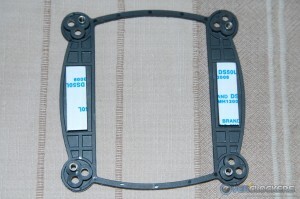 Additionally, this fan can operate from 900 ~ 2000 RPM. 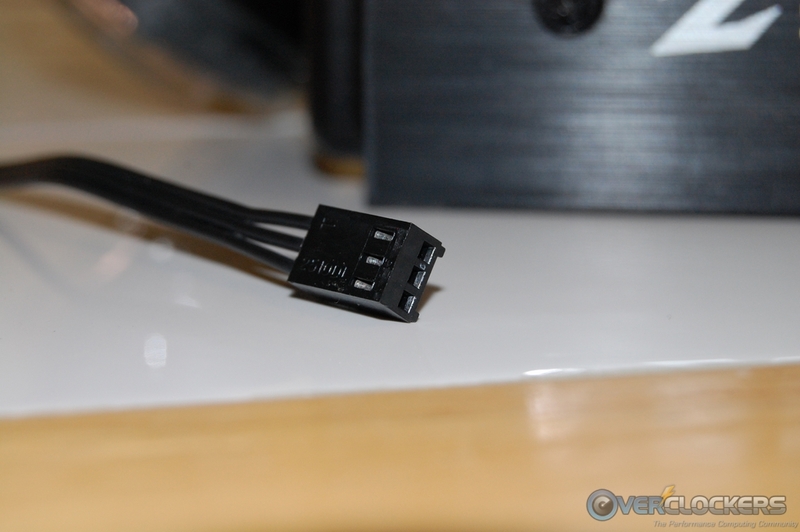 By now most of our readers are familiar with the way these AIO coolers are laid out, but there are a few things Zalman has done that might be a little different. 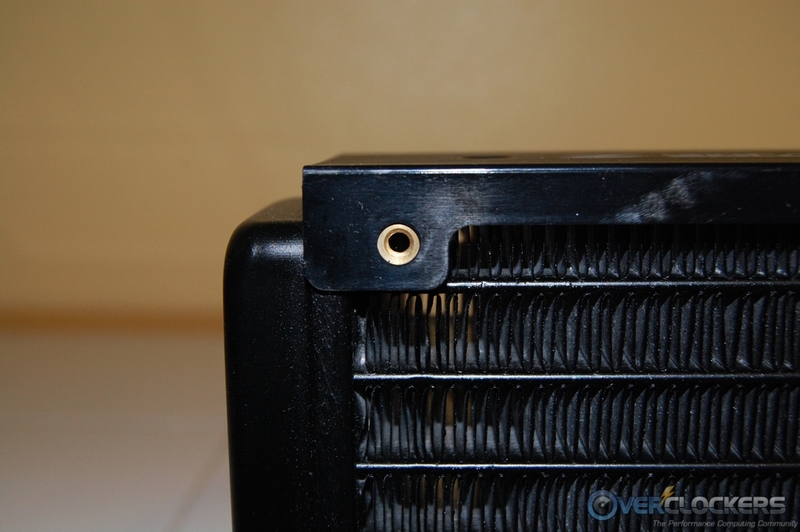 The two plastic blocks on the sides of the radiator not only look fantastic, but also provide the mounting holes for the fans. 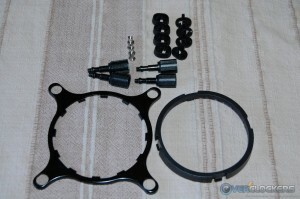 Even though only one fan is included in the kit, the option is there for installing a second fan for a push/pull setup. In a really smart move on Zalman’s part, these mounting holes appear to be made from either metal or brass inserts. 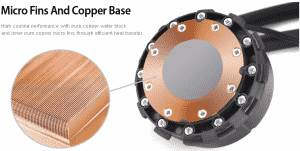 The copper base has a factory applied thermal interface material and exhibits a rather nice polish job. The polish job isn’t what I would consider a mirror like finish, but it’s pretty close. On the top of the copper base is the pump, which has a blue light glowing all around the large “Z” when powered on. The hoses are attached to the CPU block and radiator with the familiar Asetek, non-serviceable plastic bands. The entire unit is factory sealed, meaning zero maintenance. 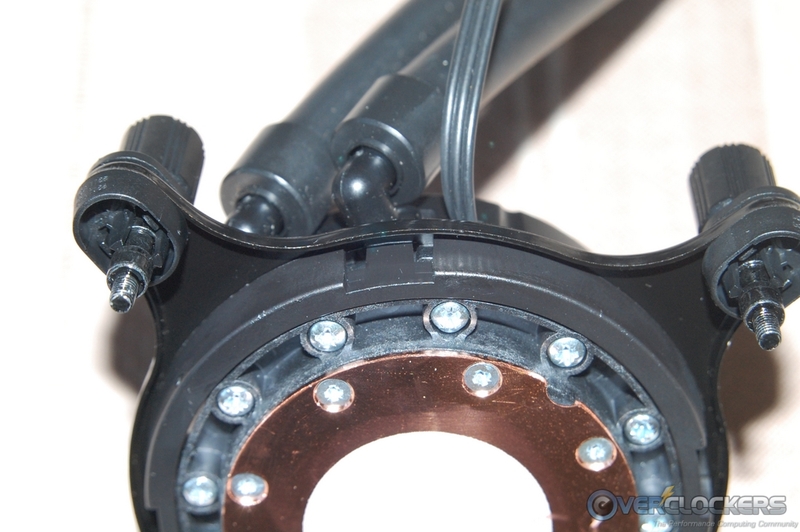 The power lead from the pump is a 3-pin design, hence it’s not PWM compatible. Typically, the pumps on Asetek units are not the most powerful things around, so it’s probably best to leave the pump running at 100% anyway. Here are several pictures that give you a close-up look at the different areas of the Zalman LQ320. 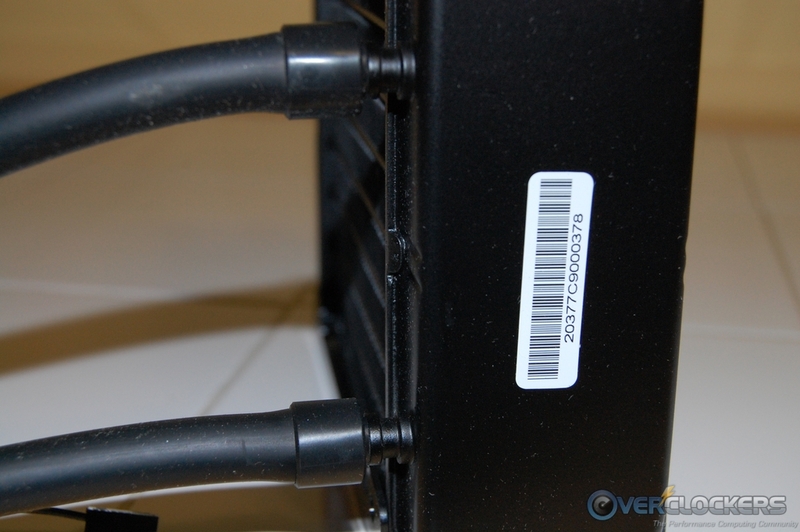 Installing the LQ320 on an AMD or Intel platform differs only by the backplate and retention bracket used. 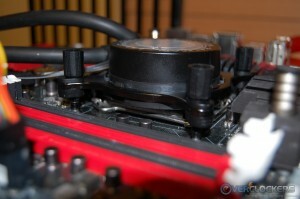 Socket 2011 Installations do not require the backplate to be installed. 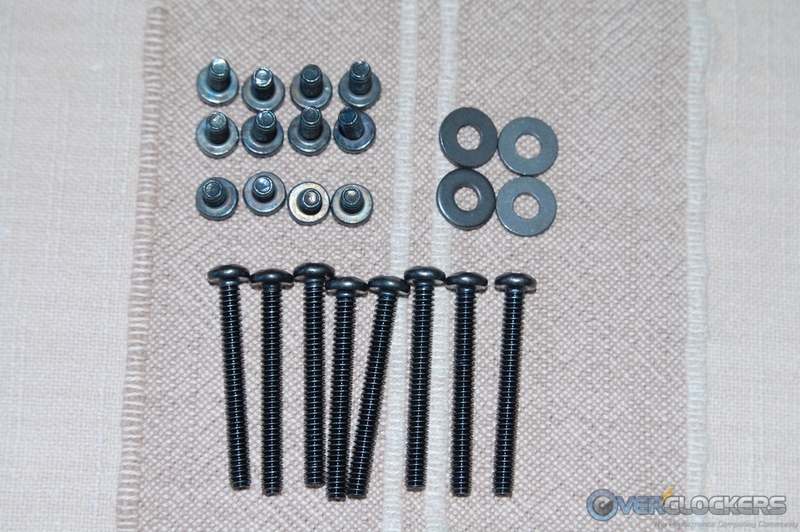 The existing socket studs already on the motherboard, along with the special bolts provided in the kit, are used for socket 2011 installs. We’ll be installing the Zalman LQ320 on our Z77 test bed, but the procedure is identical for AMD, other than the different parts required. The first thing we need to accomplish is preparing the backplate. All that needs done here is to snap the four threaded inserts in the appropriate holes, and apply the adhesive tape. 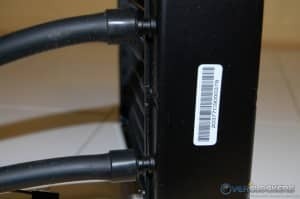 If you need to have the backplate held in place during the installation process, you’ll want to remove the peel off cover on the adhesive tape. Otherwise, there is no harm done if you decide to leave the peel off cover on the motherboard side of the adhesive tape. I typically leave it on so as not to permanently attach it, making transfer to another motherboard that much easier. 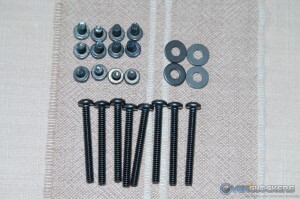 Next, we need to get the hold down bolts installed on the retention bracket. Two plastic clips snap together with the retention bracket between them. 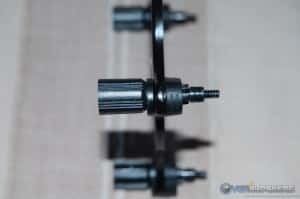 Once the two clips are installed, then simply push a bolt through the hole and you’ll feel it snap in place. There are two different positions the plastic clips can be installed on the retention bracket based on the socket type you’re working with. 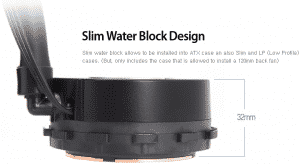 Now we need to get the completed retention bracket installed on the block/pump assembly by using the retention lock ring, All you do here is slide the retention bracket past the grooves on the block/pump assembly, then do the same with the lock ring. At that point, you can bring the two pieces together until the three clips on the lock ring snap into the retention plate. It should look like the pictures below when completed. 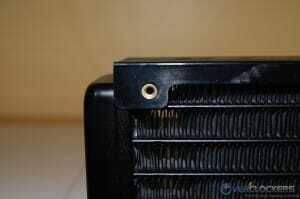 Installing the fan on the radiator simply requires using the four included screws. 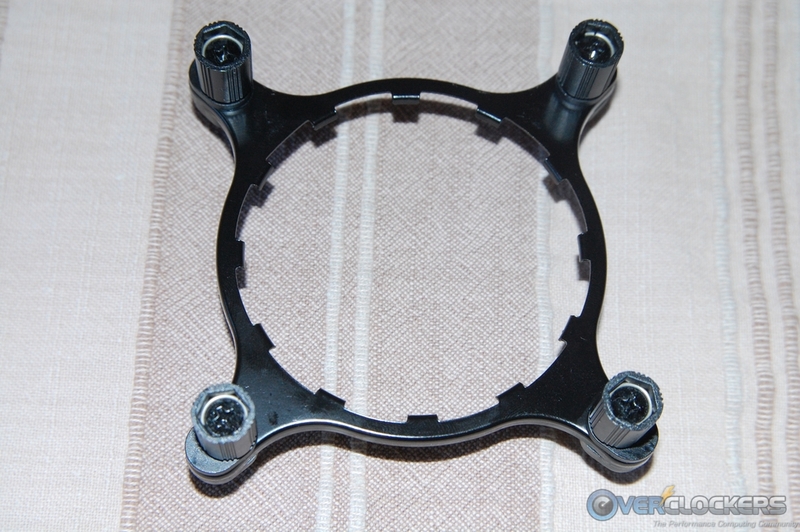 If you decide to go with two different fans on the LQ320, Zalman has included longer screws to use with fans that are not flanged like the one included in the kit. 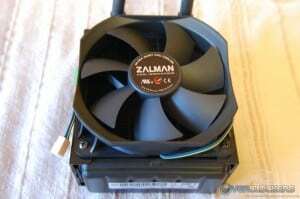 Zalman recommends installing the fan in such a manner that the air is pushed through the radiator and exhausted out of the case. That’s pretty much how most people would do it anyway as it makes the most sense. 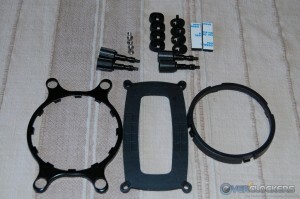 When installing the LQ320 in your case, you first want to install the radiator to the chassis. 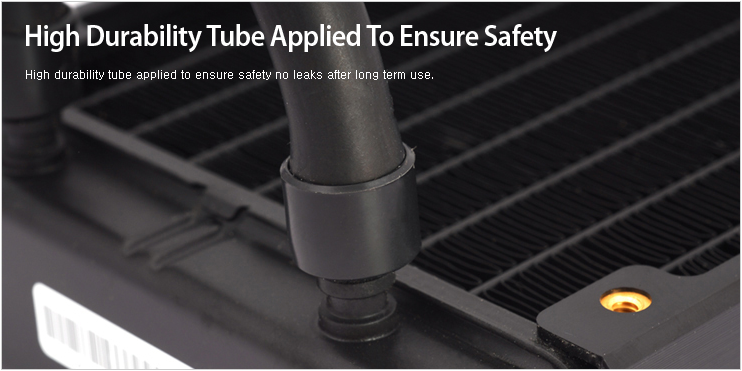 With a full 12 inches of tubing to work with, you should be able to install the radiator either at the rear exhaust fan area or even under the top deck, if your case has the appropriate provisions. Once the radiator is installed, all that’s left is to install the backplate, apply some TIM to the CPU, and screw the block/pump assembly in place. 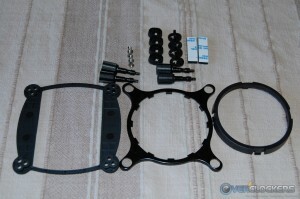 Here are a few pictures of the pump/block assembly installed on the motherboard. 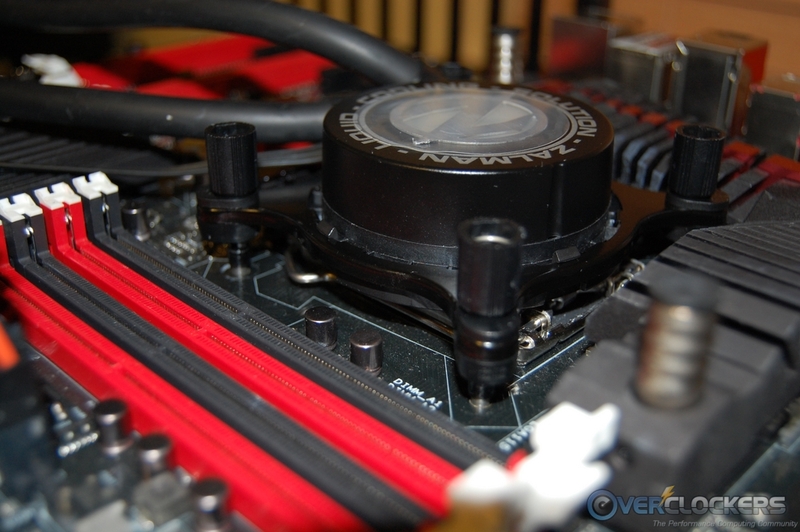 We have a mixed bag of air and AIO water coolers to use for comparison today. 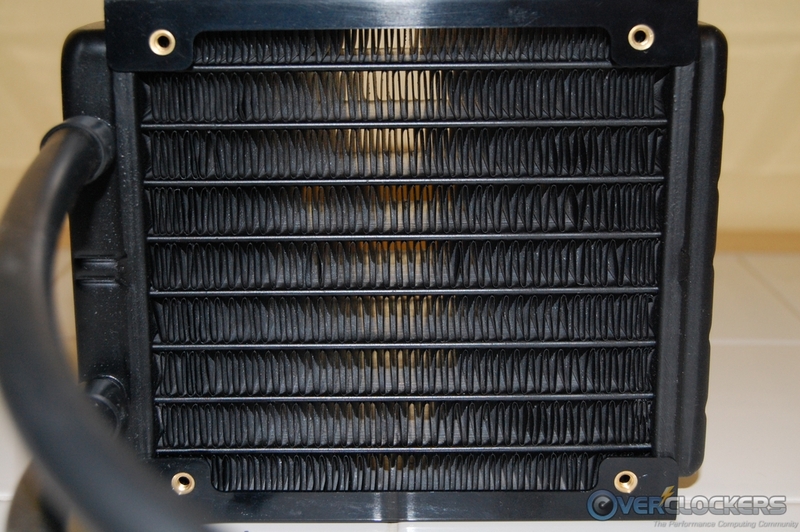 All the AIO coolers used for comparison have 240 mm radiators, whereas the Zalman LQ320 is a single 120 mm radiator. 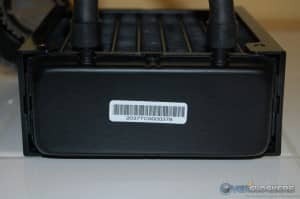 This should give you a good reference point as to the thermal capabilities the LQ320 offers when compared to higher end AIO units out there and whether the added cost is worth it to you. I tested the above units a few different ways. 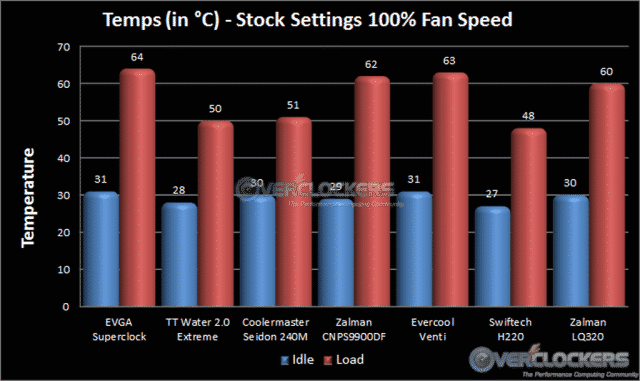 Each cooler was tested with the CPU at idle and 100% load. 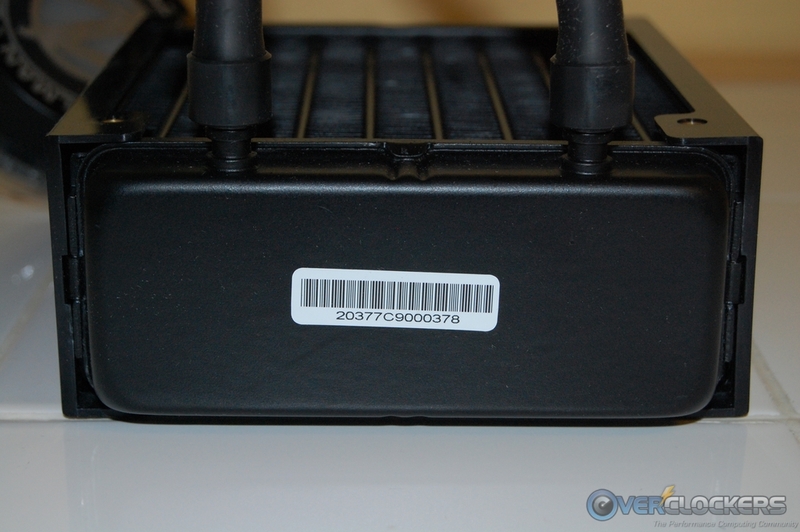 These test were performed with the motherboard at its stock settings, except for adjusting the memory speed and timings to meet manufacturers’ specifications. Then, the tests were run again with the CPU voltage set to 1.3 V and overclocked to 4.5 GHz. Additionally, I set LLC to 50%, which resulted in exactly 1.3 V at full load, or at least that’s what the monitoring software was reading. The above settings were run twice. Once with the motherboard handling the fan speed through it’s PWM function and again with the fans running at 100% constantly. All testing was done in a room at 74 °F, and I chose Arctic Silver Ceramique2 as the thermal interface material. Each comparison cooler was used with the fan that came packaged with it. For the load testing, LinX stress test was run for 10 passes, and the average temperature of all cores were recorded. For the idle results, I let the system sit idle for 30 minutes and again recorded the average temperature reading from all cores. Beginning with the test results when the CPU was set to stock speed and voltages, we see the Zalman LQ320 performing better than the air coolers and behind the other AIO coolers with bigger radiators. No surprises at all here, but it is nice to see a substantial increase from the air cooling units tested. These results held consistent when the fan was controlled by the motherboard’s PWM function and when the fan speed was set manually to 100%. With the CPU overclocked to 4.5 GHz, the Zalman LQ320 again fell right in line where expected. 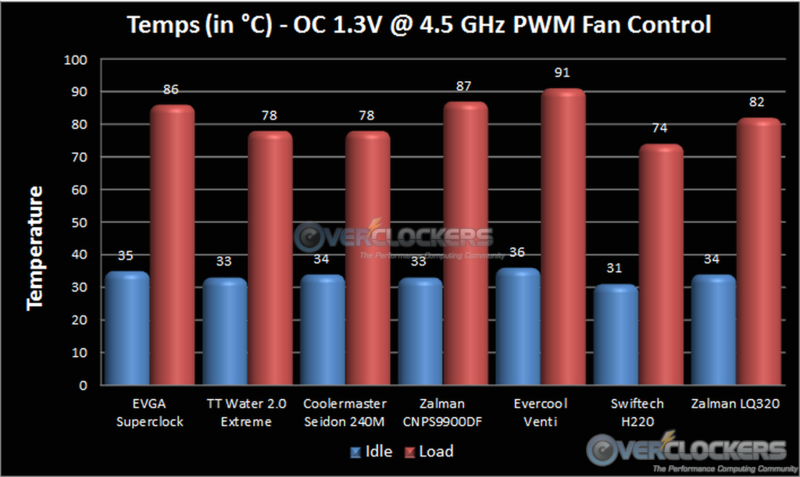 We see much better performance than all the air coolers in the comparison list. Given this is a single 120 mm radiator unit, it’s not that far off of the other AIO units with 240 mm radiators. Even with the motherboard’s PWM function controlling the fan speed, we come in well below the 90 °C we like to stay under. 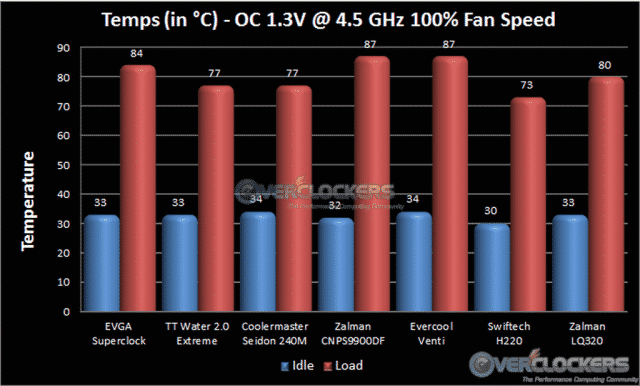 All things considered, not a bad result at all for the Zalman LQ320. 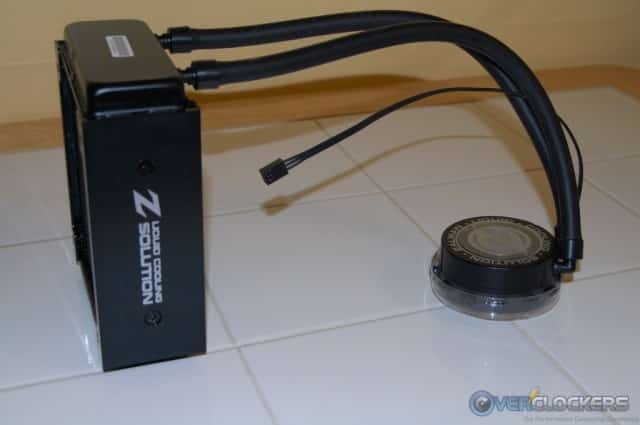 If you’re wondering how the Zalman LQ320 performs with two fans in a push/pull configuration, you can expect a 2 ~ 4 °C drop in temperatures depending upon how the fans are controlled. Most people that use a push/pull setup do so with two identical fans, but I can’t find where Zalman sells an identical fan to the one included in this kit. 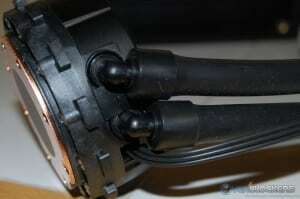 So, plan on buying two fans if a push/pull setup is in your plans with the LQ320. As far as acoustics go, it should be no surprise Zalman has a very quiet operating unit here. When the noise to thermal performance is considered, there is a great trade off with the LQ320. 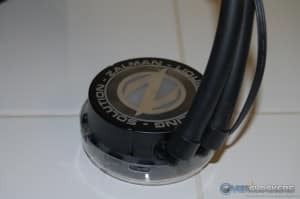 The fan is almost inaudible when at its lower RPM range; and even when ramped up to 100%, it’s not what I would consider loud. 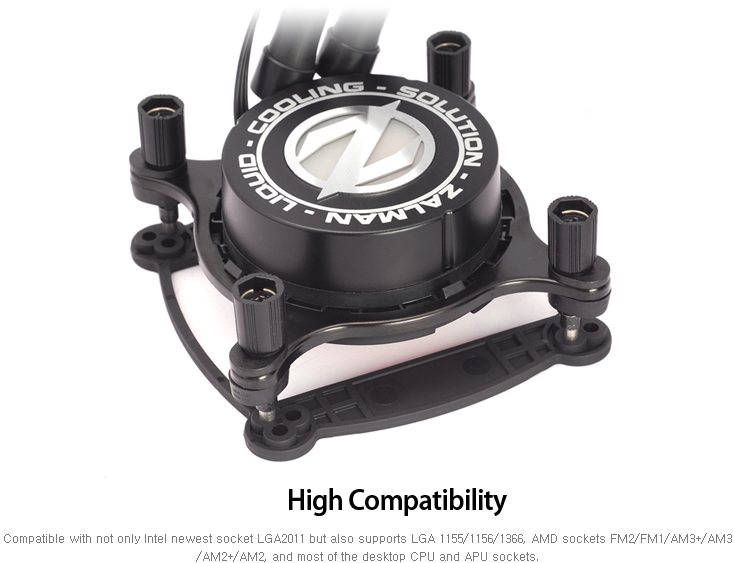 Currently, the Zalman LQ320 is selling for $108.99 at Newegg, which is consistent with other 120 mm AIO units that feature the thicker radiator design. 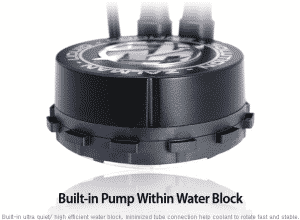 There is also a $20 rebate being offered right now, making the final cost very attractive for those looking for an AIO water cooling solution. Our benchmarking results show impressive performance increases when compared to a few air coolers; and it’s not that far off of the 240 mm radiator AIO units we tested, especially when cost versus performance is considered. 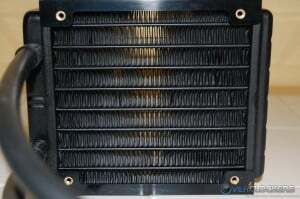 Those 240 mm radiator offerings cost substantially more than the LQ320, so the additional thermal performance they offer comes at a price. 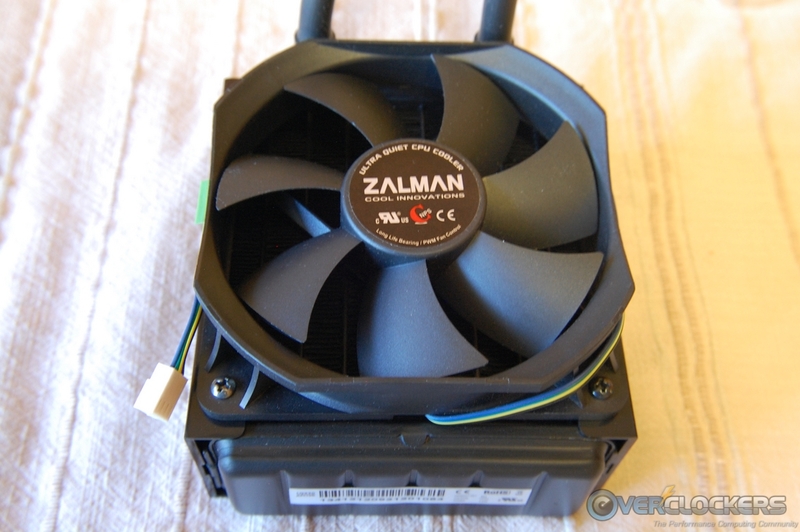 The Zalman LQ320 is one of the more attractive AIO units I’ve come across in recent months. 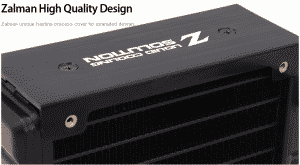 If you’re building a system with aesthetics playing a large role in the components you choose, you definitely want to look at the LQ320 to see if it fits your scheme. 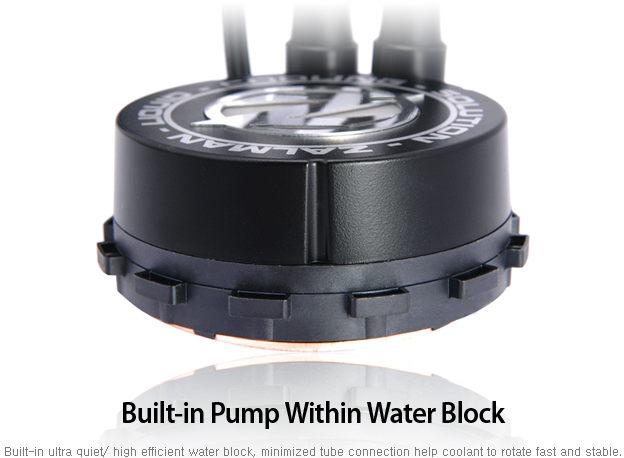 The glowing center portion of the block/pump assembly is rather unique and looks pretty cool too! 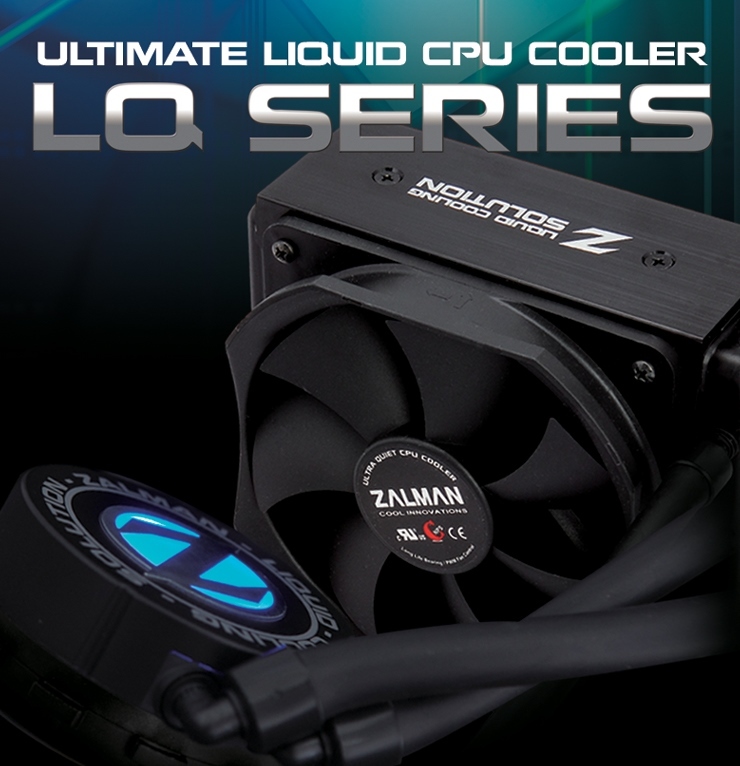 We’ll sum things up by saying the Zalman LQ320 is a very good performing AIO water cooler that does its job at a very low noise level. 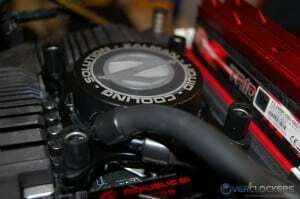 Couple that with the great looks and a reasonable price, and it all adds up to an Overclockers Approved! 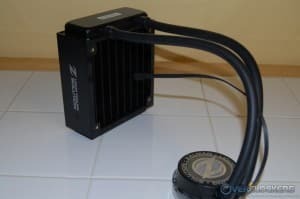 If there is one thing Zalman continues to excel in it is making an excellent looking product and it seems like this one has the performance to boot. In the past yes, none of my current rigs are though. Why do you ask?